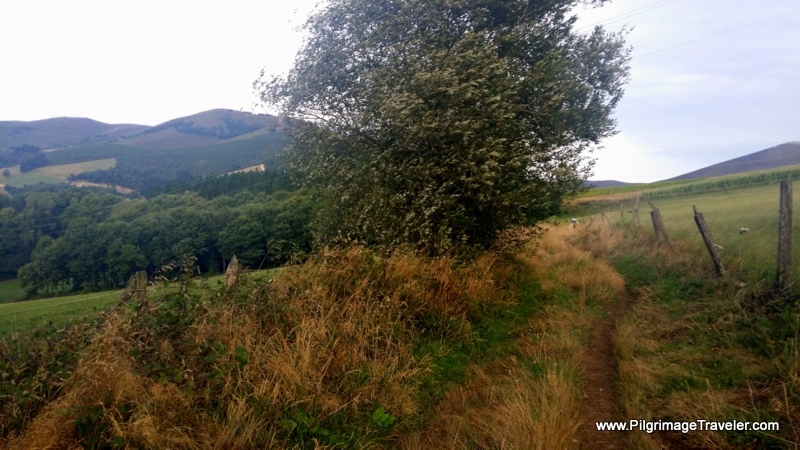 Day five on the Camino Primitivo was the most glorious day for me, in all ways ~ physically, emotionally and spiritually. In fact, I was so enthralled on this day, that I will warn you, my venerable reader, that this article will be very long. No other day impacted me like this day, from an historical perspective, and specifically from the empathy that I felt for pilgrims of all times, traveling this route. The abject hardships that the collective pilgrimage traveler had to face on this route impacted me deeply ~ and I had a "good" weather day! 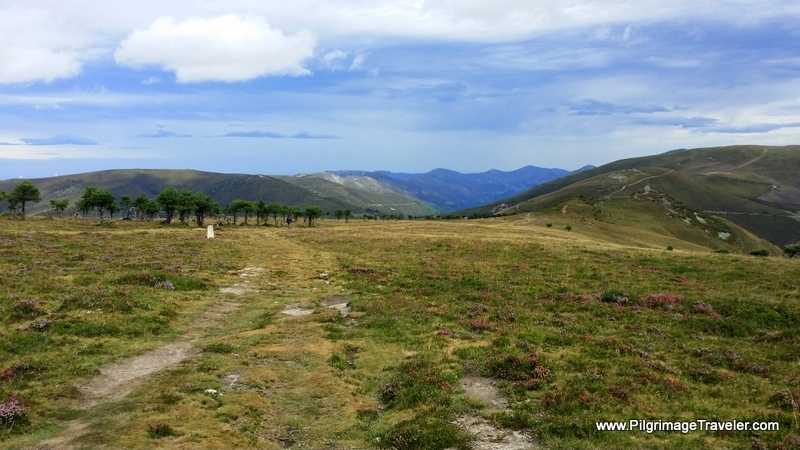 The physical thrill of hiking above the tree-line, my body and my shins finally settling in to cause no pain, a low percentage of pavement walking, no fog or rain, a full pack of food, and a personal epiphany, all led to a pilgrimage traveler's heaven. It was a day above the clouds for me. 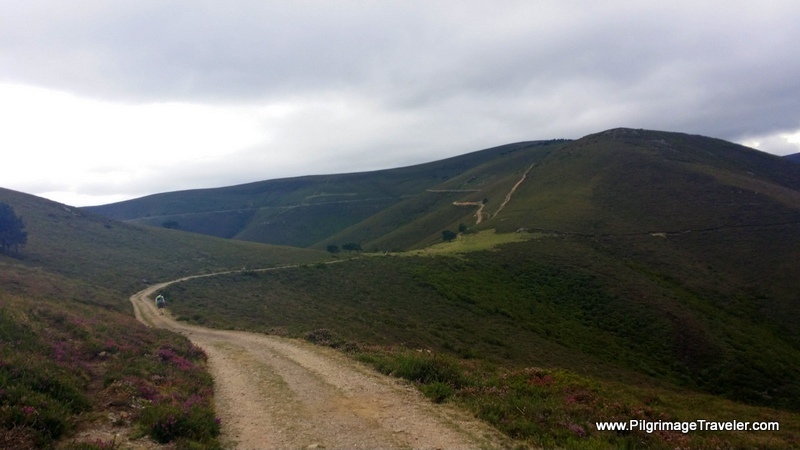 Here are the GPS tracks for our Day Five on the Hospitales Route, starting in Campiello. 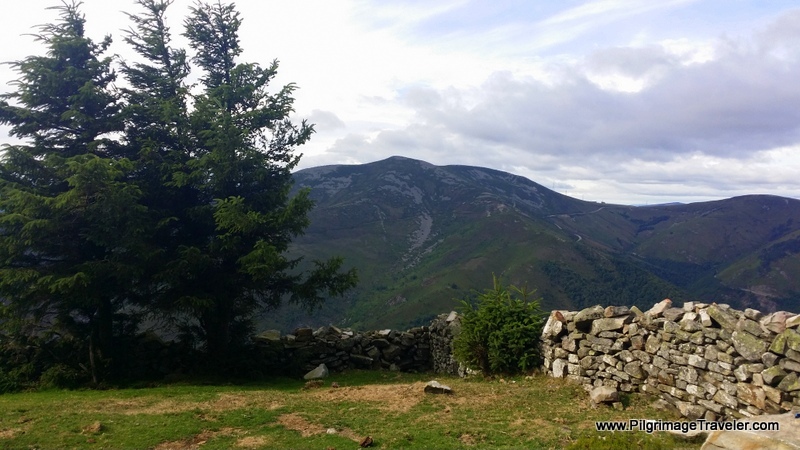 It is a long day, for which you must come prepared as there are absolutely no services from Borres until Berducedo including no albergues nor accommodations. Stock up your packs with plenty of food and water in Campiello for this day! 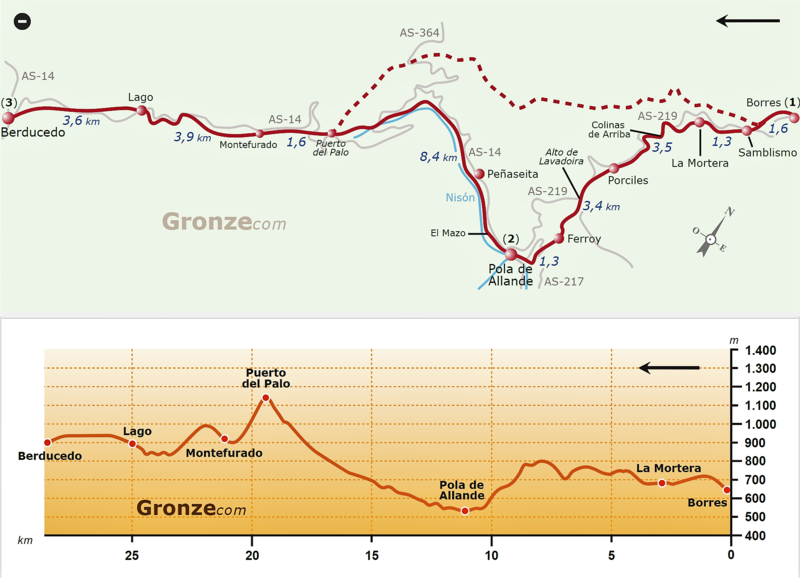 Here is the elevation profile for our day five on the Hospitales Route, but notice that this map starts in Borres, not in Campiello (see day four for that small section). 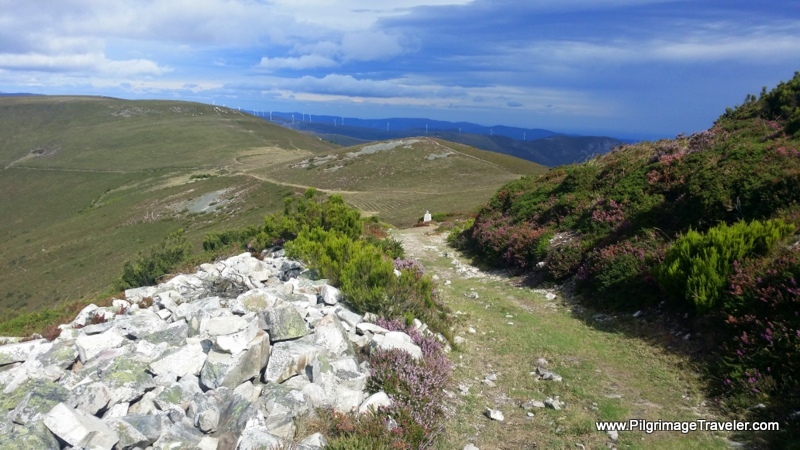 Suffice it to say that there is little to no elevation gain between Campiello and Borres, as you walk the 3.0 kilometers, mostly along roads between towns. 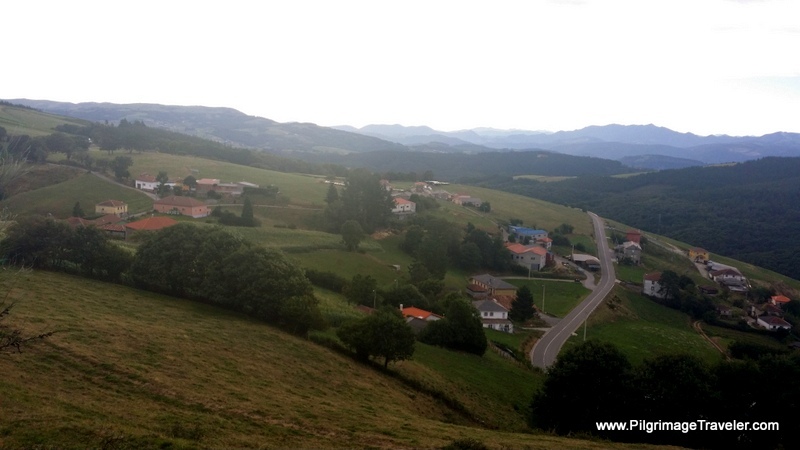 After Borres the real climb begins and the elevation gain of about 600 meters (2000 feet) is significant! 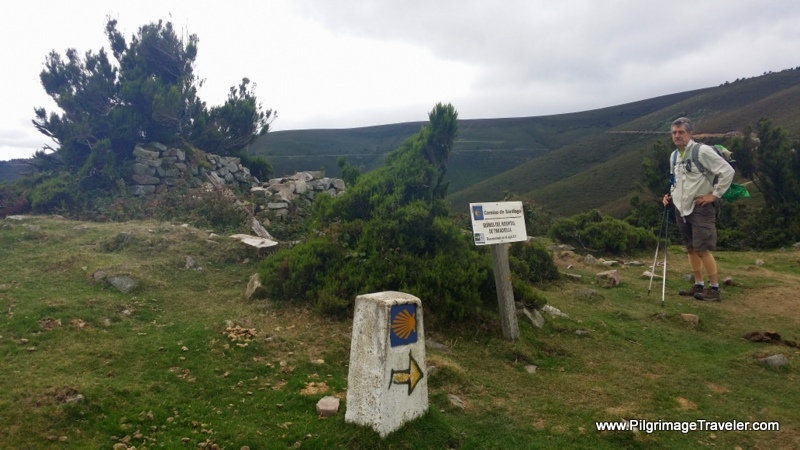 Upon reaching the Puerto del Palo, the second summit of the day, the difficulties of the day are not yet over, as the descent into Montefurado is extremely steep. 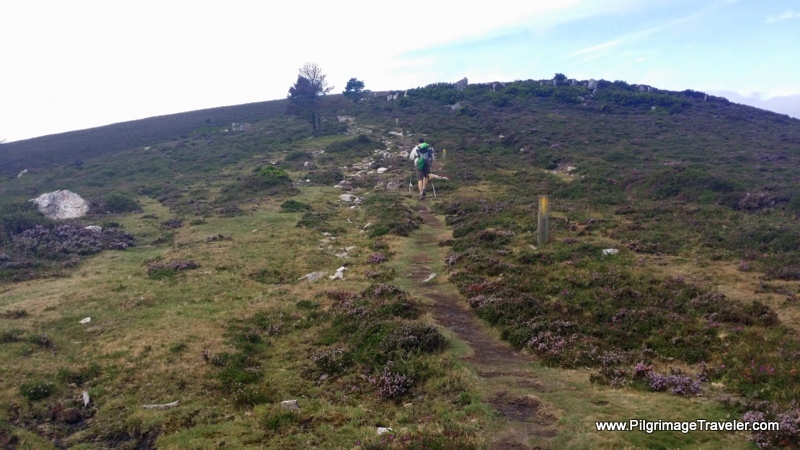 In the event that the weather is bad with fog, rain or snow, or if you prefer the route through Pola de Allande, here is the map from Gronze, for the route that we did not take, and its elevation profile. 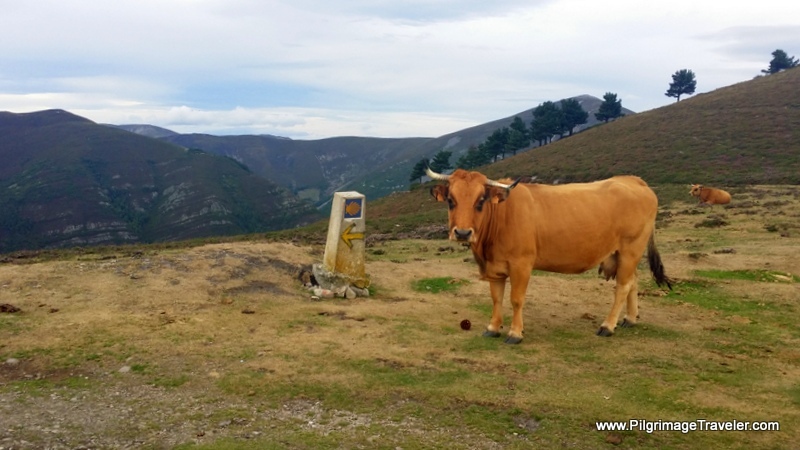 We had heard rumors of giant cups of café con leche at the Casa Hermania in Campiello. We stopped by for breakfast and were not disappointed! Accompanied by a large basket of tostada, we ate as much as we could. 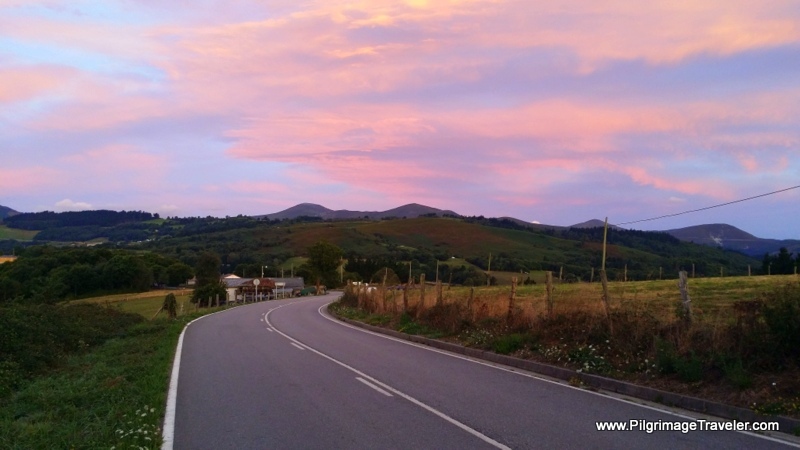 On this late August morning at 7:30 a.m., we started out our day five on the Camino Primitivo with another glorious Asturian sunrise. It made the pavement walking on the TI-3 more enjoyable. 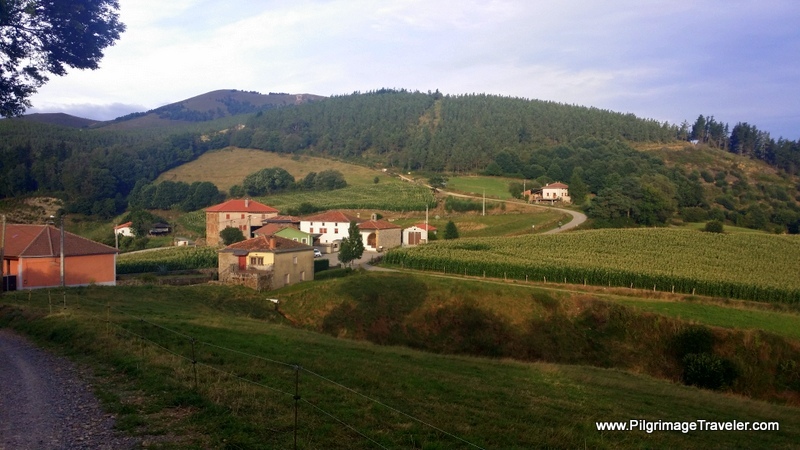 The road took us through El Fresno and El Espin, where it veers off on a side road to the south, on lovely quiet roads into Borres. 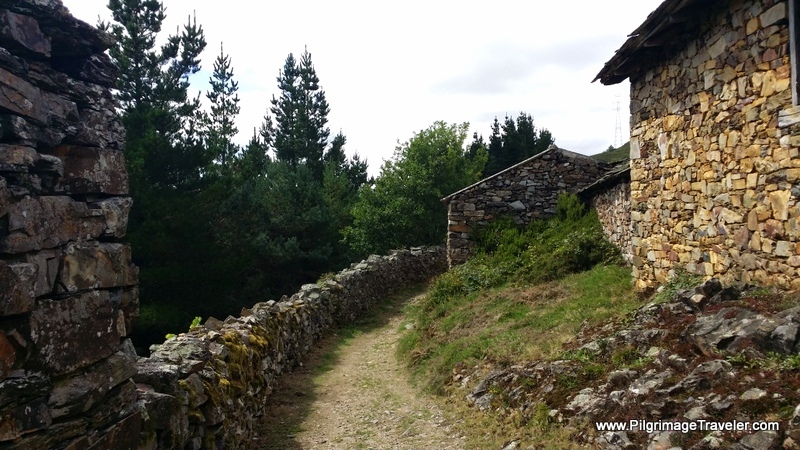 In the town of Borres, the Original Way crosses the AS-219 and immediately starts its almost 600 meter (2000 foot) climb. 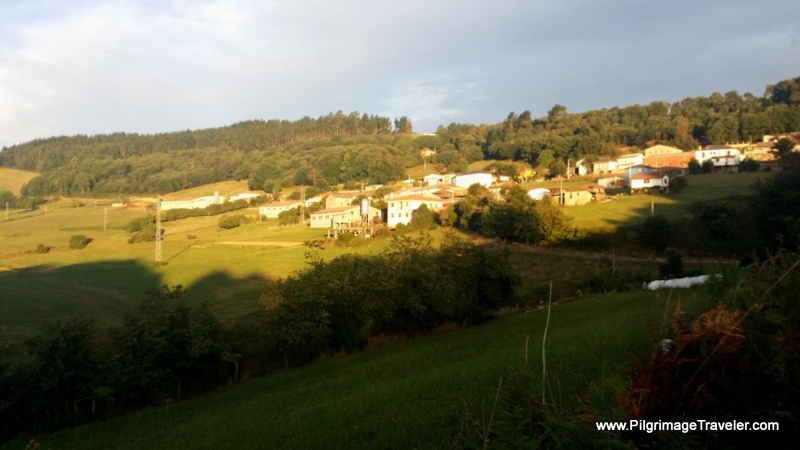 Here is Borres, in the photo below, with the early morning light on it. 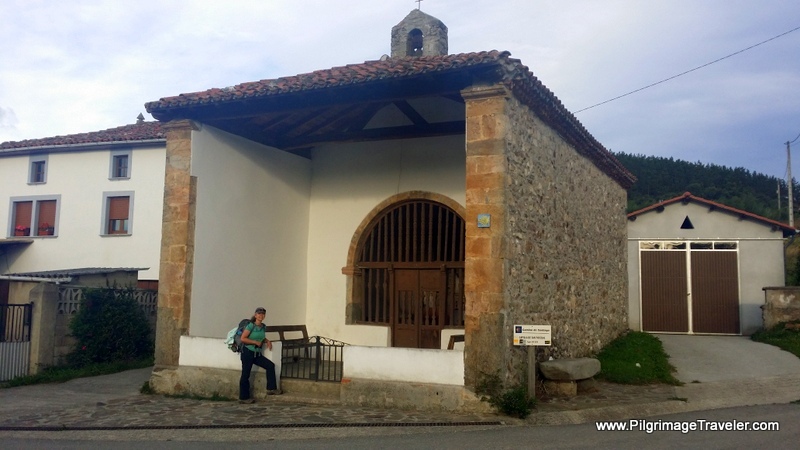 There is a municipal Albergue de Peregrinos de Borres here, a very basic 20-bed accommodation where you must retrieve the keys at the town bar, El Barín, shown on our map above. Apparently, there have been some improvements in 2016, so the bad reports may no longer apply. 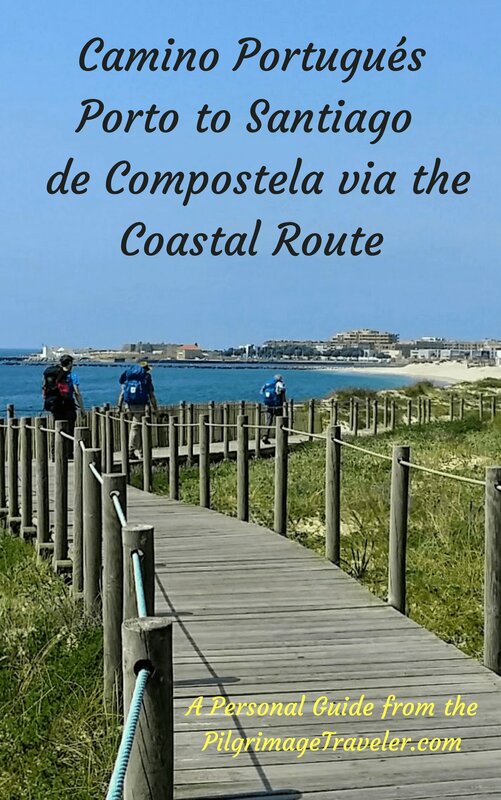 Hospitales or La Pola Route? 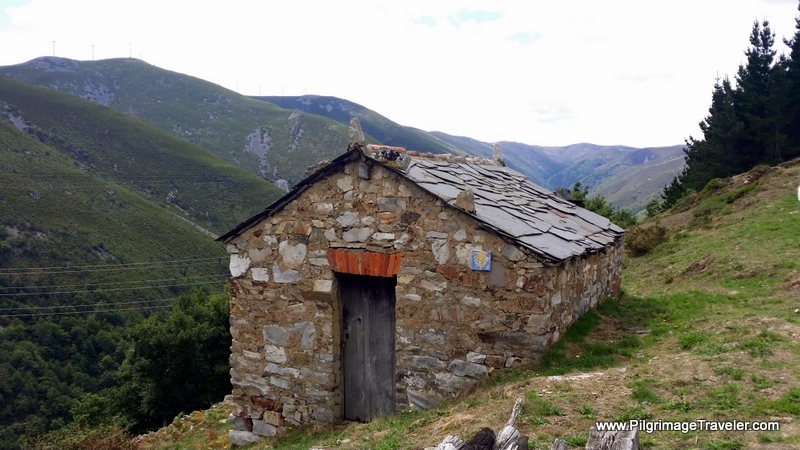 Just beyond the decision point is the hamlet of Samblismo, where a new private Samblismo Albergue de Peregrinos with six places can be found, the first house just after the split in the route. If you plan to stay here, I would definitely recommend reservations, since the place is so small. 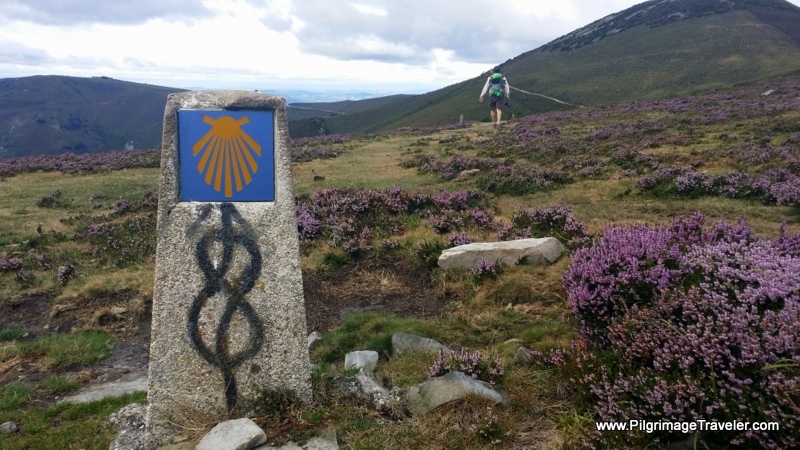 Since the weather was clear, we decided, of course, to take the Hospitales Route, the original pilgrimage way. I know of no one who has taken the Pola Route as their first choice. If you come to this crossroad, and the weather is bad, please consider your choice very carefully. Apparently, when it is foggy, finding your way is next to impossible. If it is snowing, it is impossible. 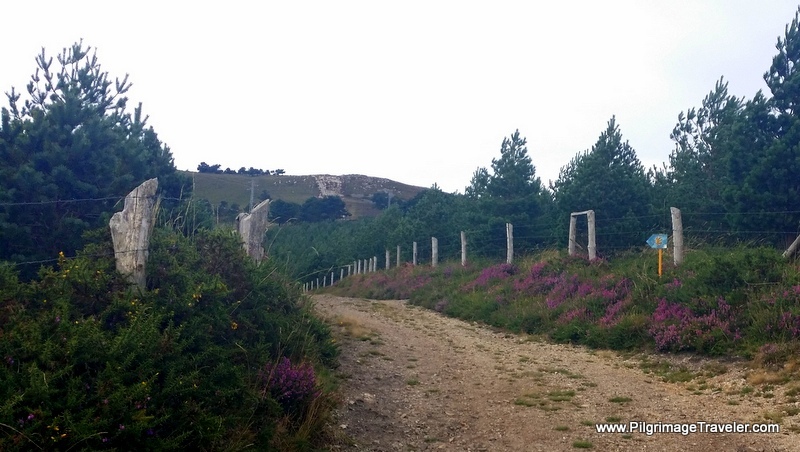 I hear from my readers that the waymarking is much improved, however, why would you want to take the chance? Even though we had a mostly clear day, the wind was ferocious up there, coming off the sea, I suppose. It was very difficult going for a long while in the never-ceasing wind. I would not have wanted to be caught in the weather in this very exposed place. 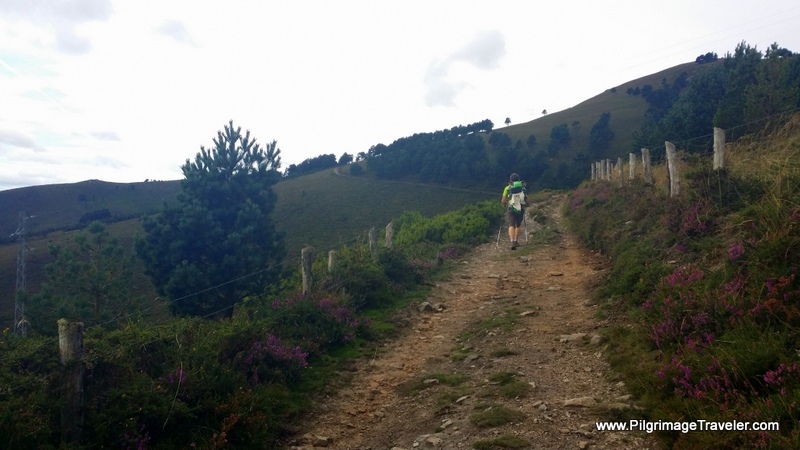 After choosing the Hospitales Route, we continued on its strenuous climb. My chest constriction and post-nasal drip were better than on day four, since I refrained from drinking wine the prior night and I got a good, solid, eight hours of sleep. I did cough some through the night, but my energy levels felt high. 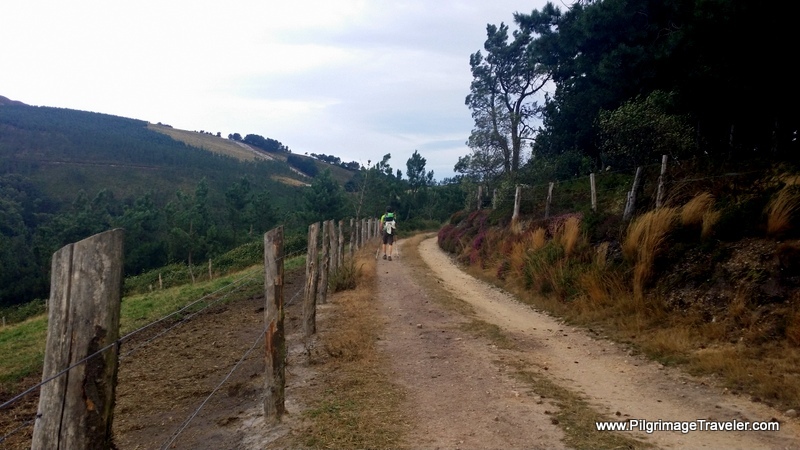 While we ran into the Three Amigos, early on, I decided that I was going to give up any need to push myself too hard on this day. (see day four if you're interested in my not-so gracious race and the Three Amigos). 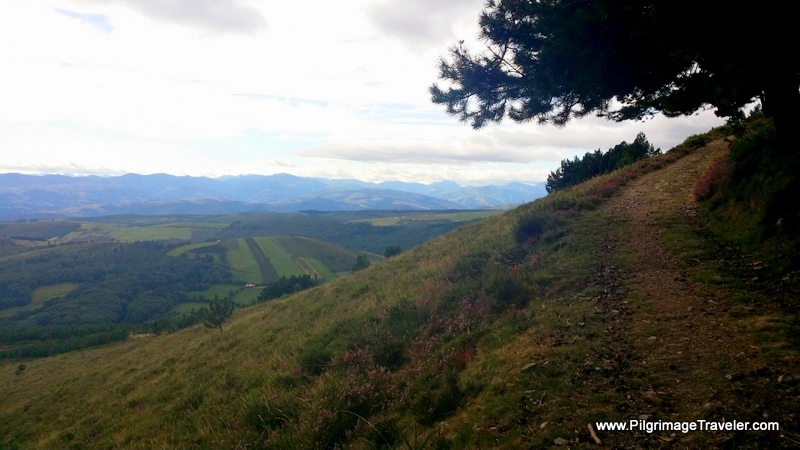 Within about six kilometers, the hamlet of La Mortera comes into view. 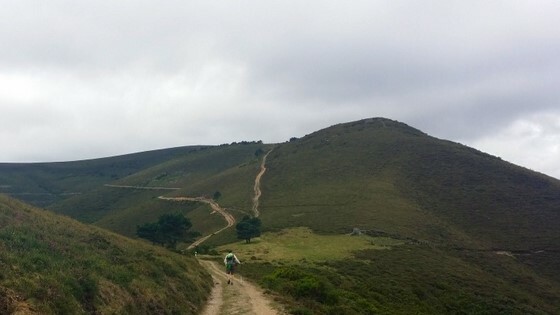 As I viewed the chapel from afar, I witnessed a group of five pilgrims, rushing right by the chapel, on the race to the top, or the race to the end, or to wherever. I smiled at my own tendency to race. I thought how different it would have been for the medieval pilgrims. 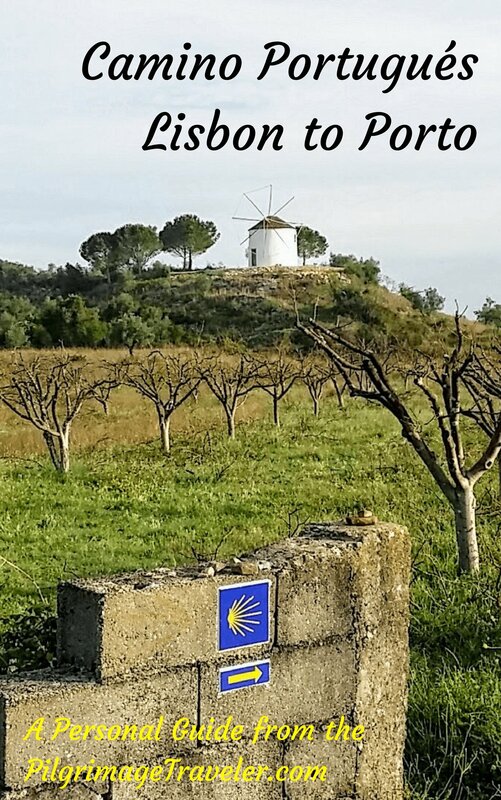 Most likely, at each little chapel along the way, they would have stopped and prayed, and asked for absolution from something, or maybe broke bread, or maybe stayed the night, Who knows? But they would have paid homage to what was there for them, because every chapel is a pilgrimage stop along the way. 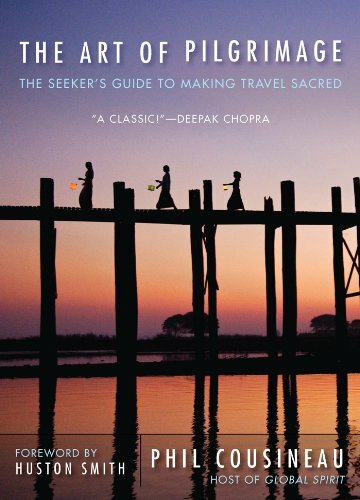 For pilgrims in previous centuries, their journey was a test of their faith amidst incredible hardships. Perhaps we modern pilgrims have lost this purpose? Then all of a sudden I had this flash of insight, that indeed, my pilgrimage is a test of my faith; but with a difference. 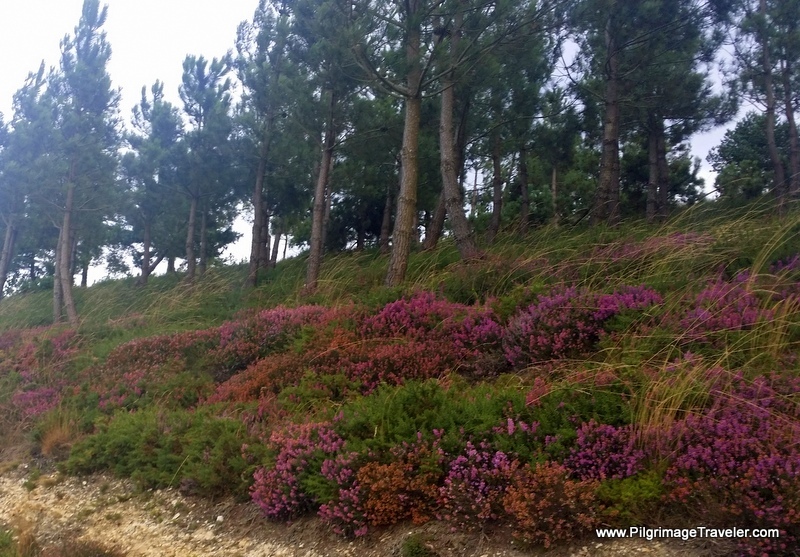 I thought: My pilgrimage is a test of my faith in myself. Immediately I got an overwhelming sense of emotion, which included a strong body-reaction. I couldn't name the emotion, or determine what it meant in the moment. It was a spontaneous thought. Or was it? 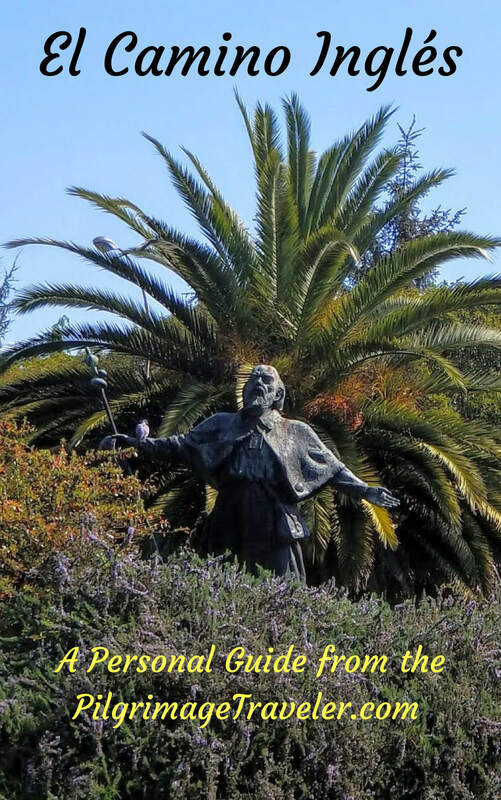 The first place that my heart wanted to go, was that my pilgrimage was a test of my faith in myself and my belief that God is in me, guiding me on my path. 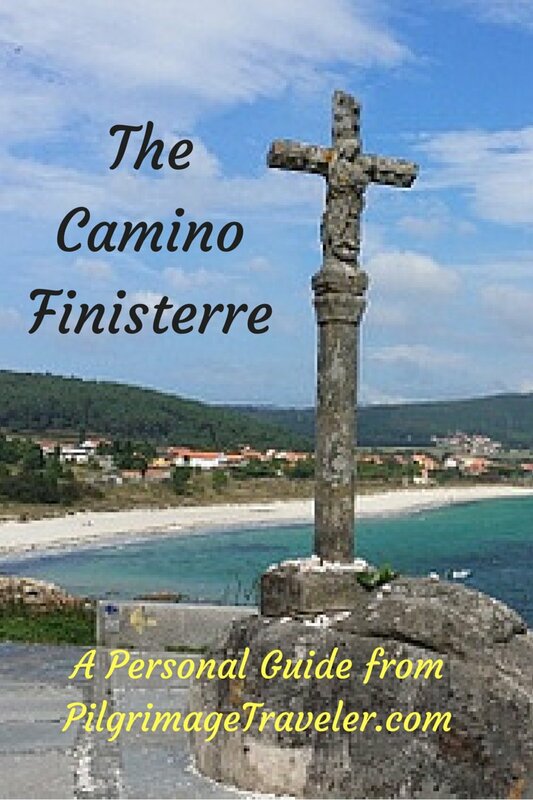 For the medieval pilgrims they paid homage to a God who was an external force. This force just whipped them around causing all kinds of travesties in their lives. For me, it was my faith in myself to believe that God is there, God is in me, and God will provide. 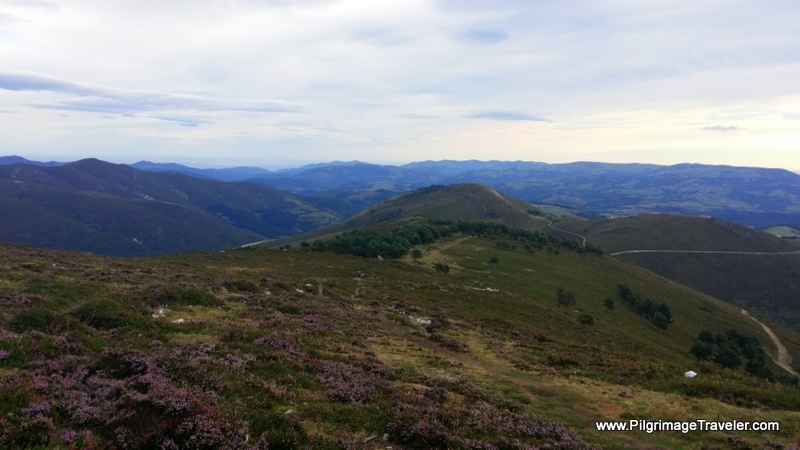 It was a pretty nice insight for me on my day five of the Camino Primitivo. 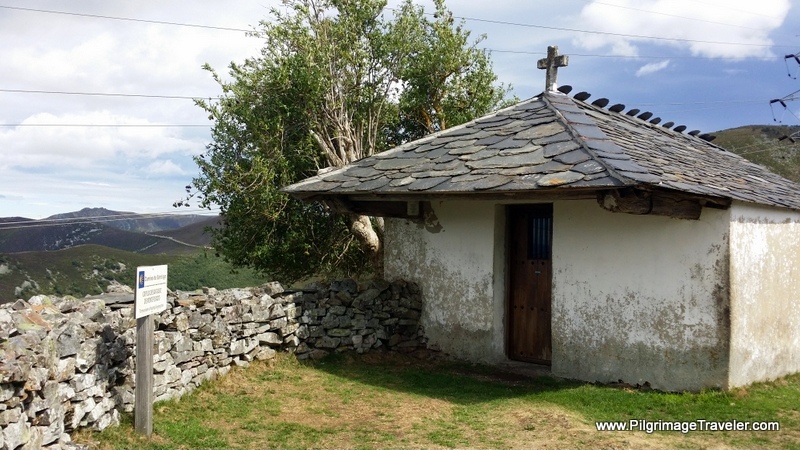 Once I got to the actual Capilla, below, I spent about 10 minutes there, absorbing the collective spirit of all the pilgrimage travelers that had come before me, for whatever reason and with whatever belief. For their aspirations and mine, I was so grateful, to be part of this amazing community of souls. For better or for worse, we come together to unite as one people, one heart, one soul. We walked on, looking back on this last small town. It was indeed, bye-bye civilization for most of the remainder of the day. The rest of my journey, will have fewer comments. The journey's story will be told mostly in the photos. 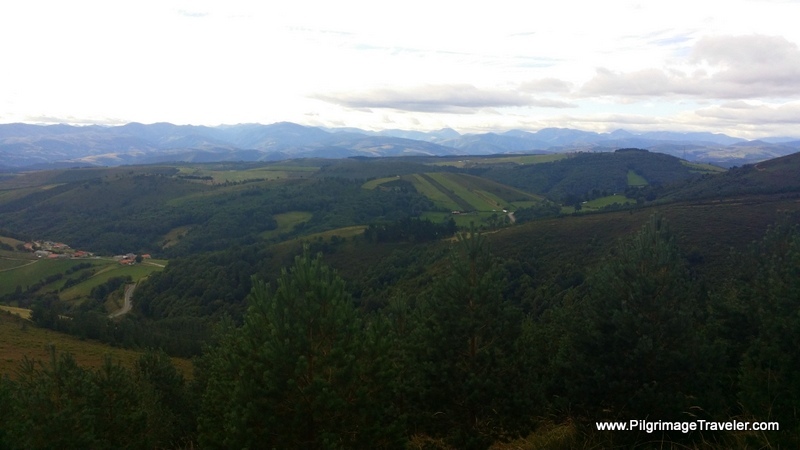 By the time we reached these sweeping views, my spirit was flying. The emotional joy I felt at being here created the necessary physical vitality to meet the demands of the journey. From a purely physical standpoint, my shins and feet no longer hurt at all. This feeling was true even on the very steep downhills later on. As we neared the highest and most exposed part of the route, we had to stop and put on layers to protect against the winds that were rushing up from the valley floors below. 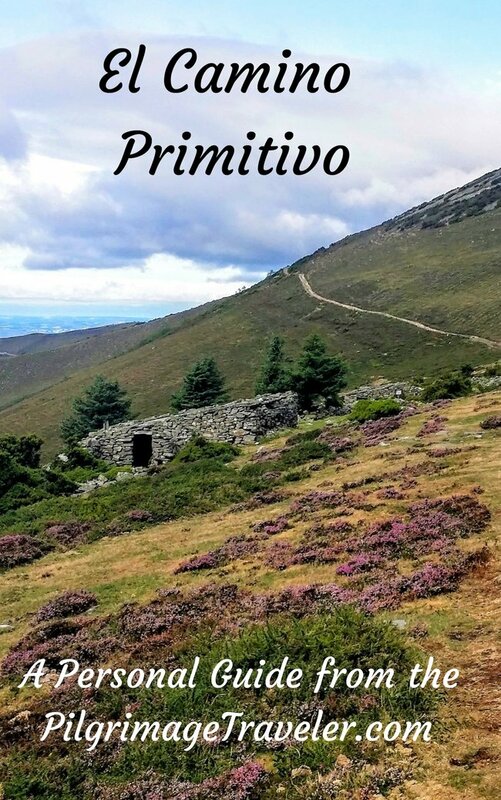 After about two-and-a-half hours of walking on day five on the Camino Primitivo, we arrived at the ruins of the Hospital de Paradiella. Hospitals, in the middle centuries were often under royal protection and were staffed by Catholic orders. The wind at this juncture was amazingly strong. I don't know if you can see the grimace on Rich's face. He was finding it difficult to stand still to hold this pose! It took me three shots to get this one right! I'd yell at him to stand still, and he could barely hear me above the wind! Do not underestimate the exposure of this place! There is not much left of the Hospital de Paradiella. Even though this photo looks like clear weather here, it was anything but comfortable! The trees tell the tale. All wind-blown and gnarled. Food, shelter and even clothing were given to the pilgrims at the hospitals. If they were ill, care was provided. Donations were encouraged but many poor pilgrims were in rough shape, with insufficient warm clothes and often in poor health. I can only imagine the struggle just to get from one hospital to the next under these conditions. Some of them barely made it. While our weather was not sunny and calm, at least it wasn't foggy and raining. 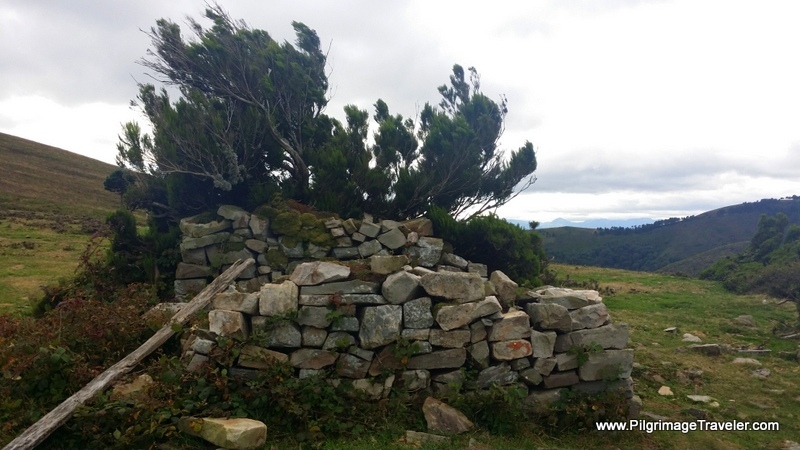 We did have to exert considerable effort as we struggled through the wind in this area. It truly was relentless! Why the Catholic order chose to build at this spot, seemed crazy to me at first. But perhaps because of the exposed conditions here, was precisely why they did build here. It was an area where the most need existed. We hurried on to find a more sheltered spot. 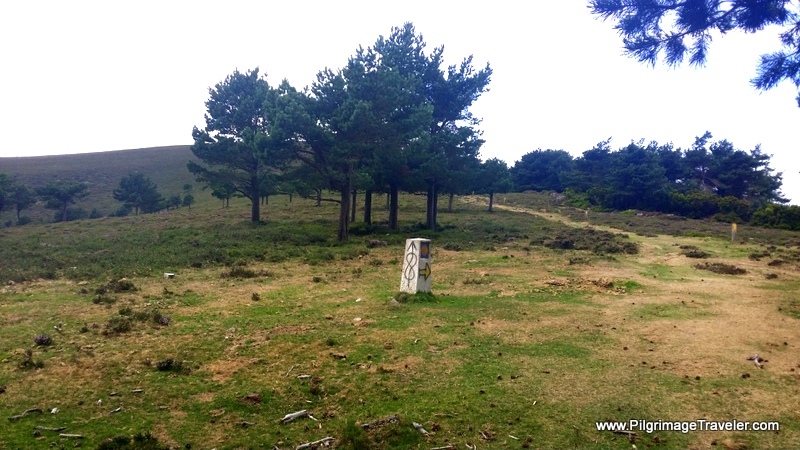 As you can see from the following photos, there are frequent waymarks and yellow arrows on posts. The visibility was good on this day, but frequently, it is not. 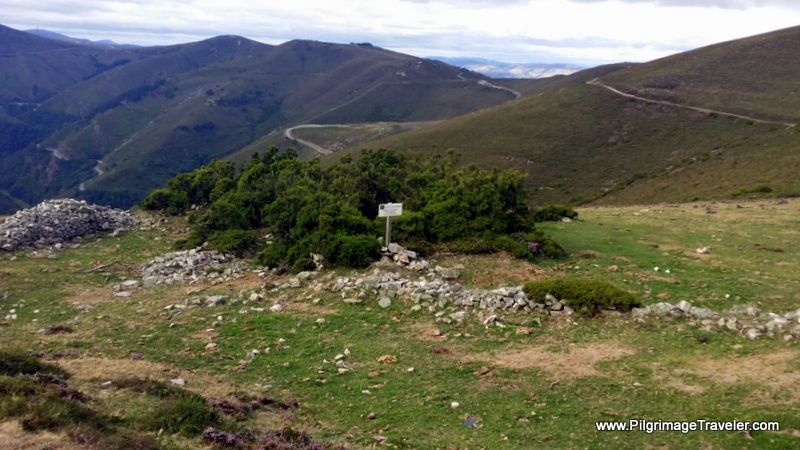 I believe this photo captures the highest point on day five, Camino Primitivo, of over 1200 meters (about 3900 feet). Forty-five minutes and 2.2 kilometers later, we arrived at the ruins of the second hospital. It is the most well-preserved of the three. The walk continued to be a struggle due to the relentless wind. My husband said it was like taking one step forward and two steps sideways! The views from up here are absolutely phenomenal. Unfortunately, we couldn't eat lunch and look out over the view, because the wind was way too strong to sit comfortably out in the open. I can just imagine the pilgrims of yore, huddling together in these small shelters, shivering with fever, sipping on soup and trying to get warm by a small fire. 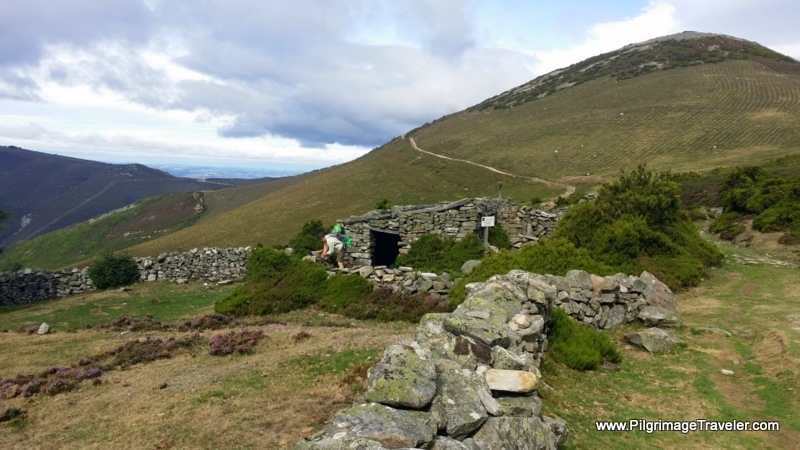 My day five on the Camino Primitivo was so much easier than what these determined medieval pilgrimage travelers had to go through. 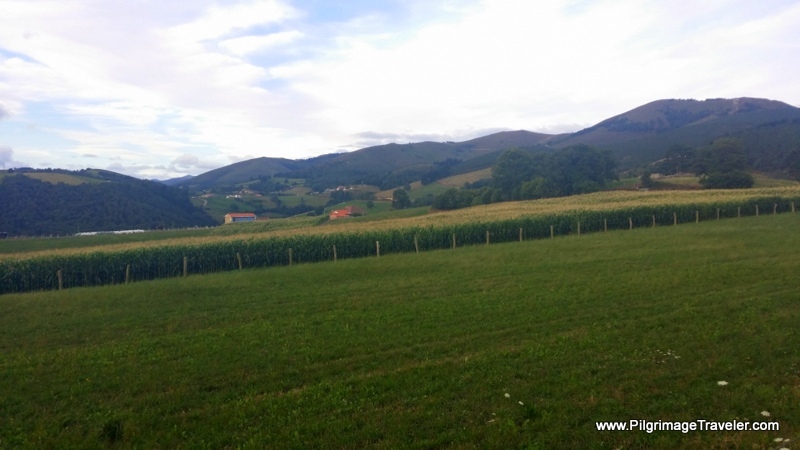 I was grateful for albergues (in valleys! 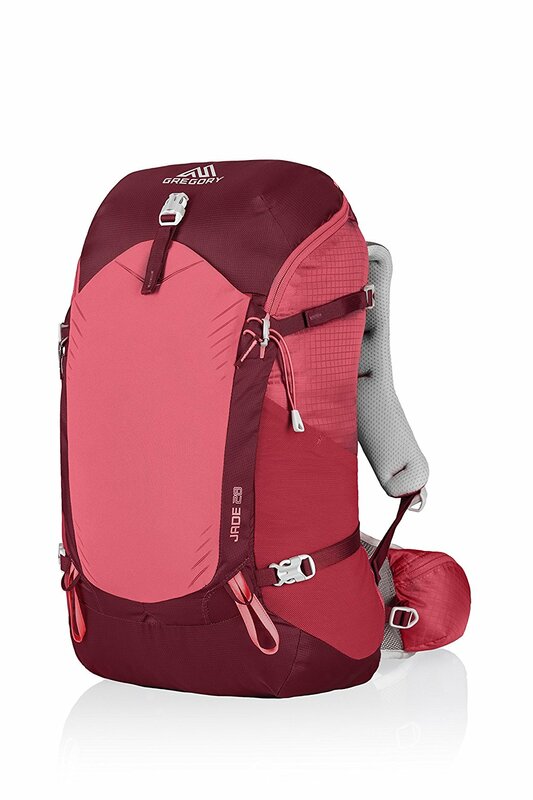 ), Gortex, lightweight packs, sturdy shoes, warm high-tech layers and the ability to afford a pack full of food. 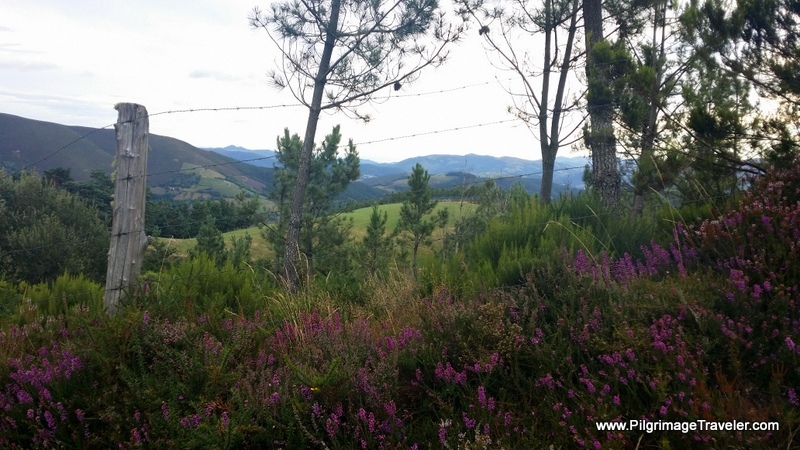 We encountered this lovely little flower on day five of our Camino Primitivo. This bright little flower grew close to the ground because of the harshness of the weather. However, it is a bulb-grower whose flower comes first, in August, then the leaves come later. 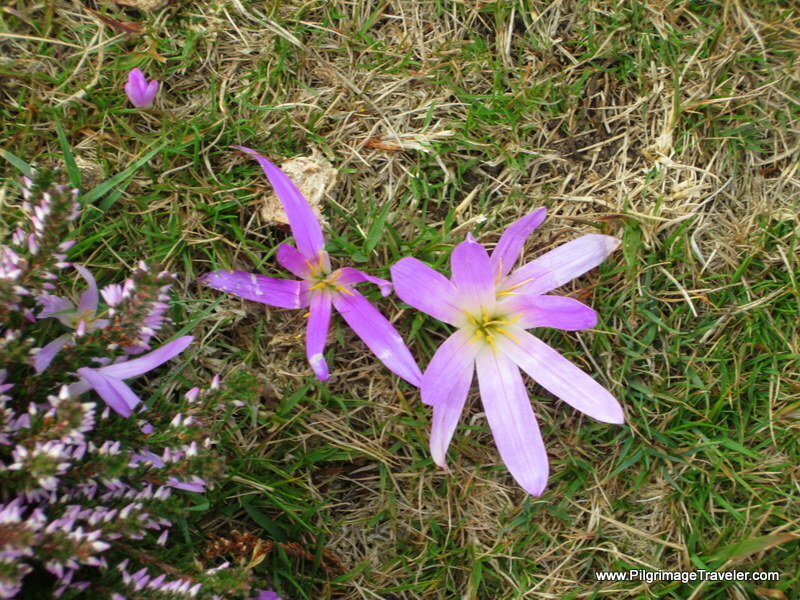 It is called Colchicum Montanum or August Crocus, in English and Merendera Montana in Spanish. The third hospital, the Hospital de Valparaiso is so ruined, that without the signpost, one could very easily walk right on by it. We arrived here, 1.6 kilometers later and about 20 minutes after our lunch. The descent on the leeward side went pretty quickly! 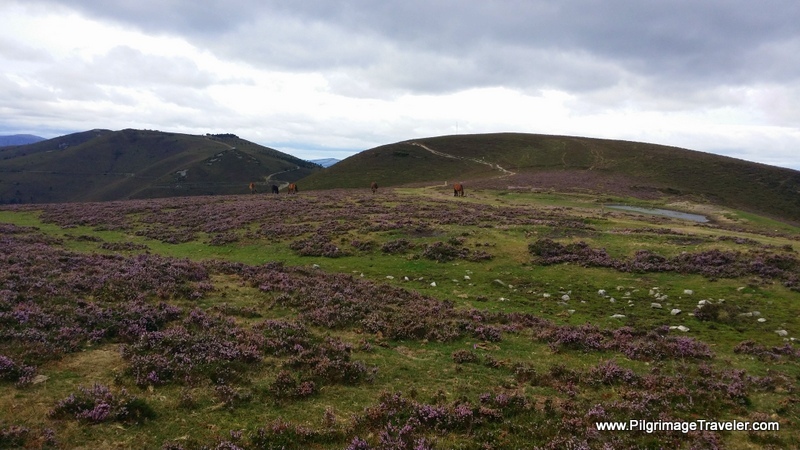 Even though the weather looks threatening, it never did rain the entire day five on the Camino Primitivo. We were very lucky! The Original Way runs along the "top" for glorious views all around. 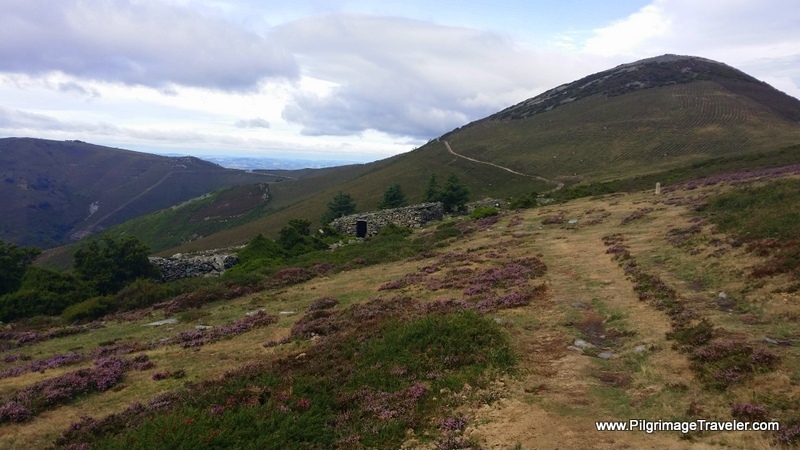 Then all of the sudden, it drops and joins the AS-219 briefly at a high pass called the Alto de la Marta, at 1105 meters (not pictured). 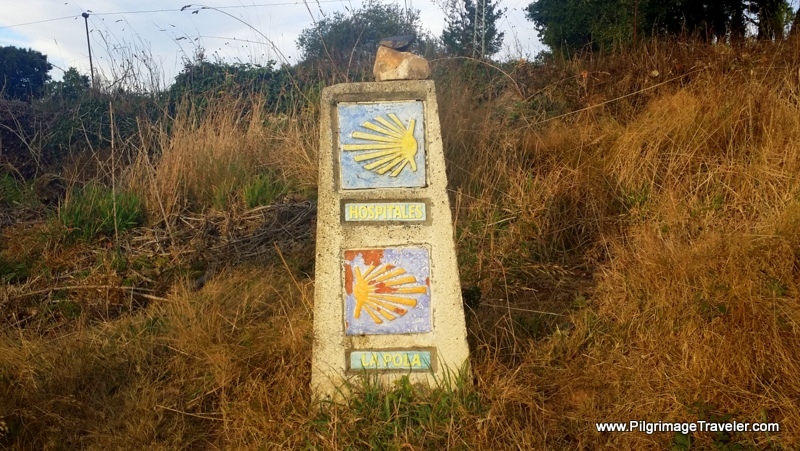 When you reach this point, you are more than half way through your day, and getting close to the Puerto del Palo. At this point, below, at the Puerto del Palo, the two routes converge at the AS-14. 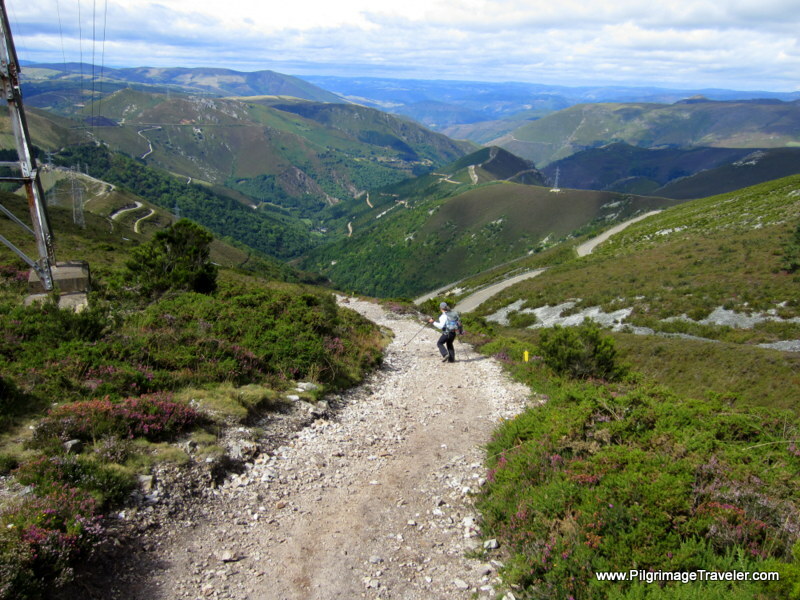 This is where the Pola de Allande joins the Hospitales route. 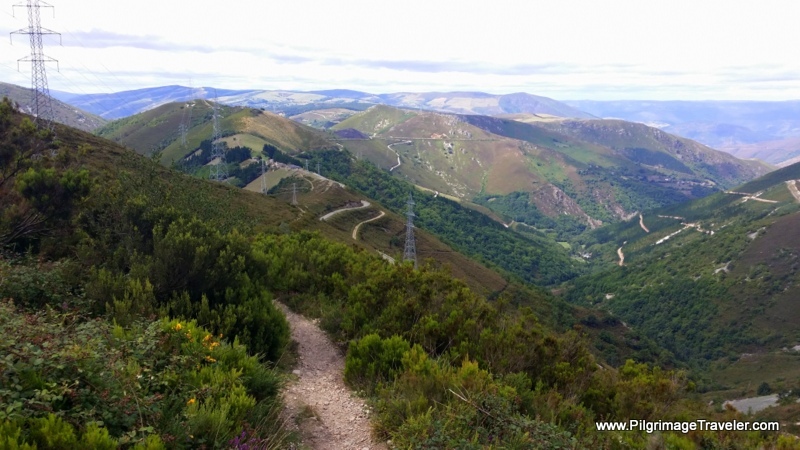 I don't show the highway at this convergence, but it is a place that is quite obvious, as you come off the upper elevation, you see the road to the side of the Camino and the power line that you will be following downward to your right. 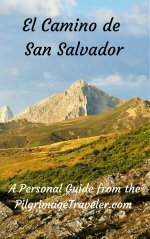 There is a small hut at the Puerto del Palo, called the Refugio del Puerto del Palo, which I placed on our Google map above. However, it is a tiny structure, made of concrete that should be used in emergencies only! The power line, is visible on the left, and the AS-14 is visible below, in the photo. The way is very, very steep here, and you can see that I am essentially side stepping it, as I use my poles to help me brake. 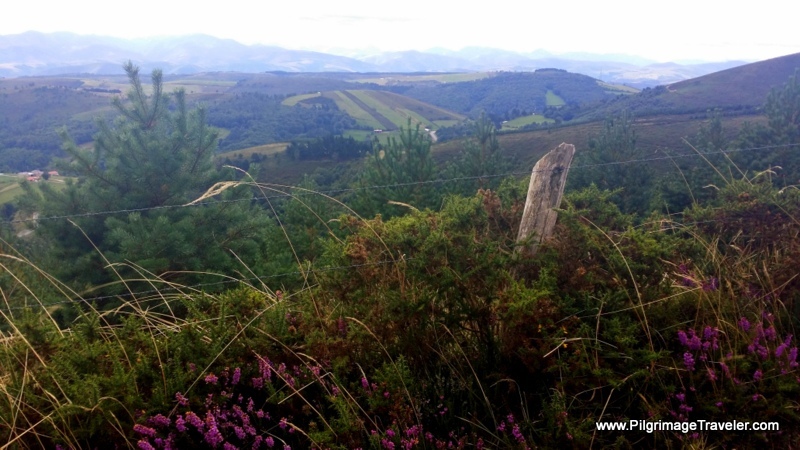 The view of the valley below is astounding, despite the power poles. You can even faintly see Montefurado on the lower ridge by the power poles. 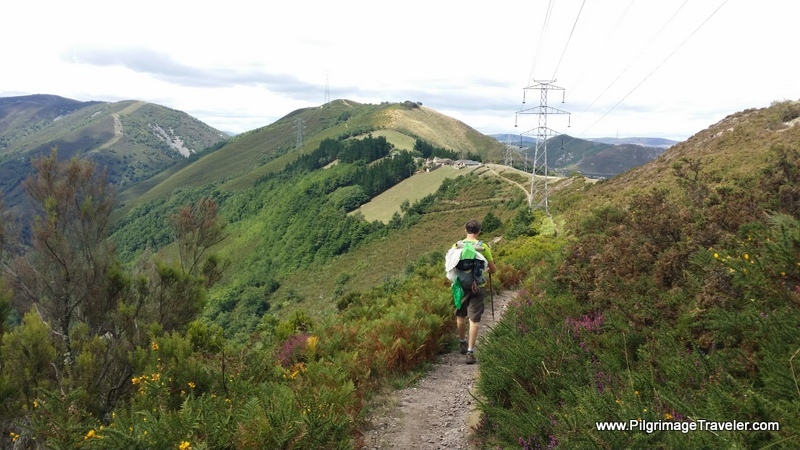 On day five of the Camino Primitivo, it continues to follow the power line into Montefurado. You can see the hamlet, off in the distance, on the ridge top. 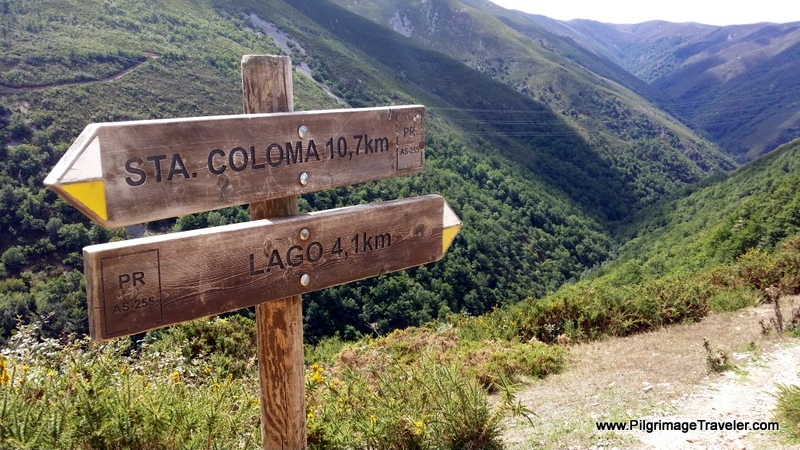 When we reached this signpost, just before Montefurado, we were happy to see that Lago was only four kilometers, and Berducedo another three, for only a total of seven kilometers and very little elevation change left to go! 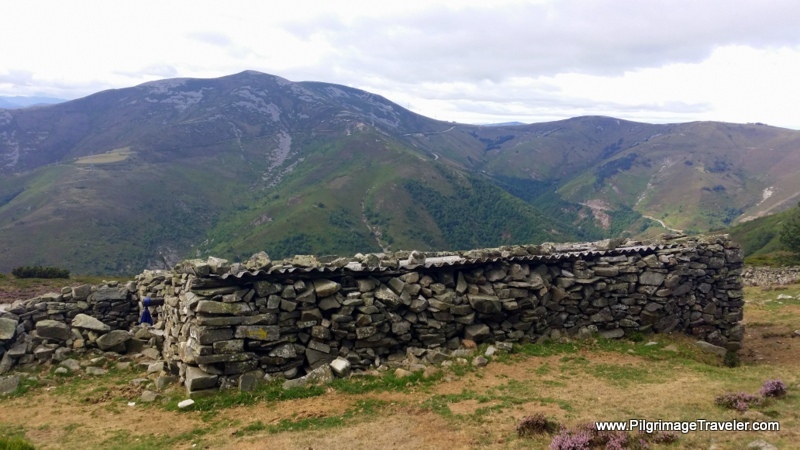 The small chapel at Montefurado gave me a small respite while I breathed a quick prayer of gratitude as I stopped and enjoyed the view. 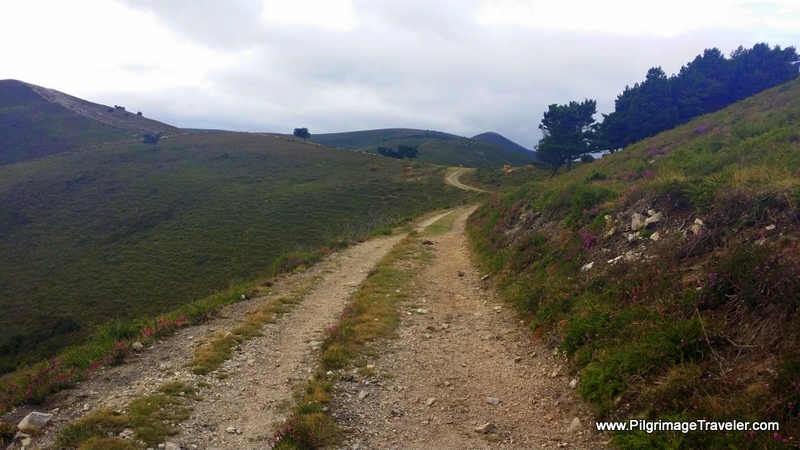 Once you enter Montefurado, you essentially join the banks of the AS-14, all the way into Lago, then on it to Berducedo on day five of the Camino Primitivo. 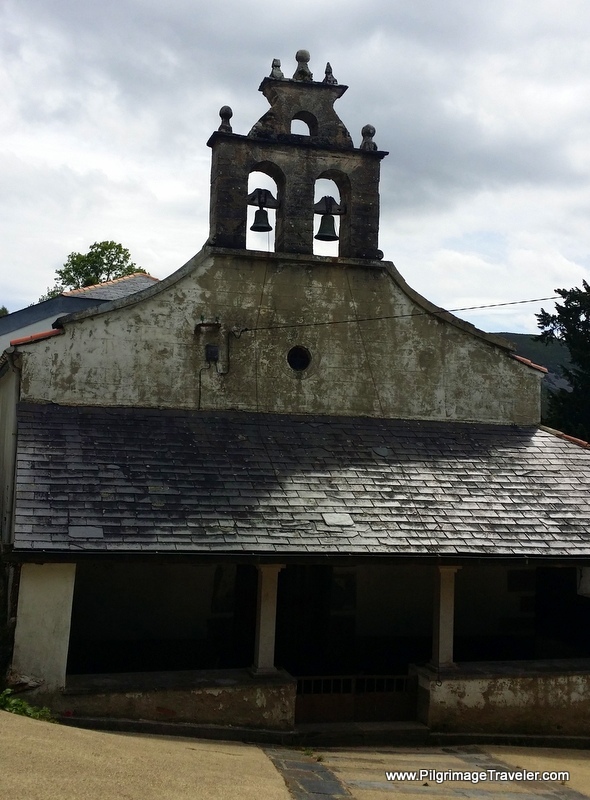 The path comes out at Lago, four kilometers later, and walks by the church, below. It is a nice shady place, with benches to sit and a grotto to meditate by. 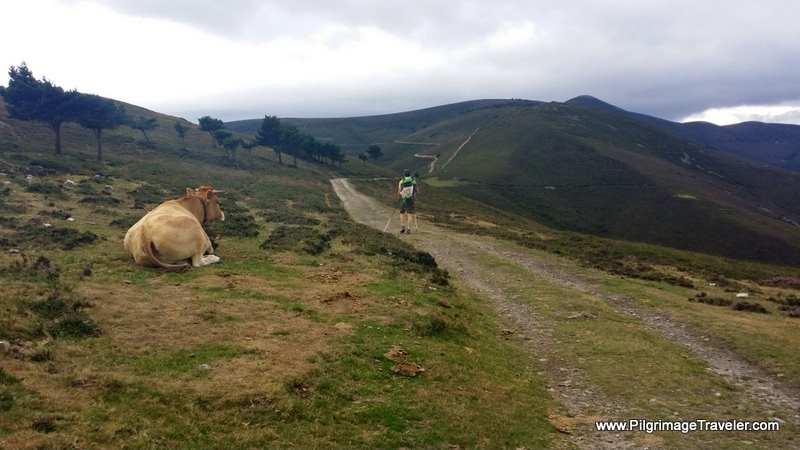 We stumbled on James, a Camino family member, and interrupted his respite here. We all joined together to walk up the hill and into Lago. When we walked here, there was an open bar in Lago at the edge of town, where we joined friends for a nice break. Sadly, I have been informed by my readers that it is no longer open! There is now, truly nothing from Borres to Berducedo. 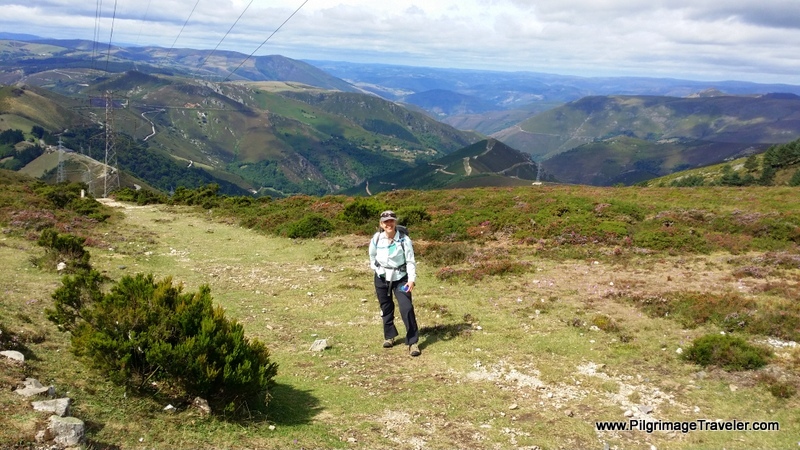 After another quick 3.7 kilometers along the AS-14, we arrived one hour later, around 3:15 at Berducedo on day five of our Camino Primitivo. 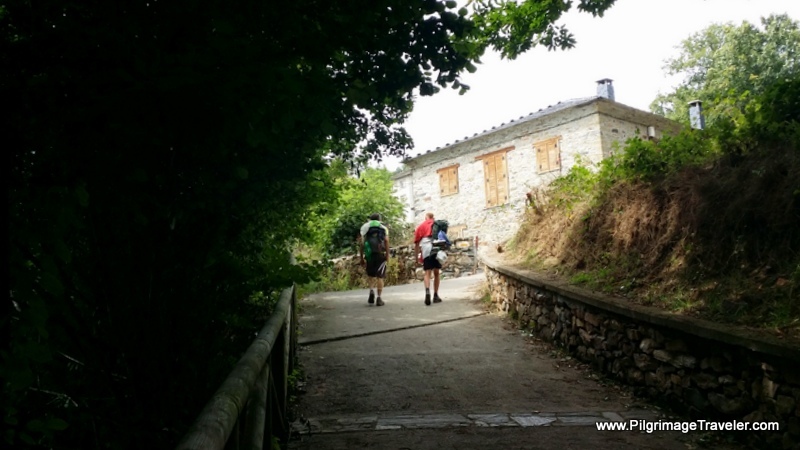 The Camino walks right by the first accommodation, the municipal Albergue de Peregrinos de Berducedo, with 12 places and a kitchen. We chose the Bar Casa Marques, a few steps farther along in town, below, over the municipal albergue which looked barely tolerable to my spoiled eyes. They have an albergue and also private rooms if desired. 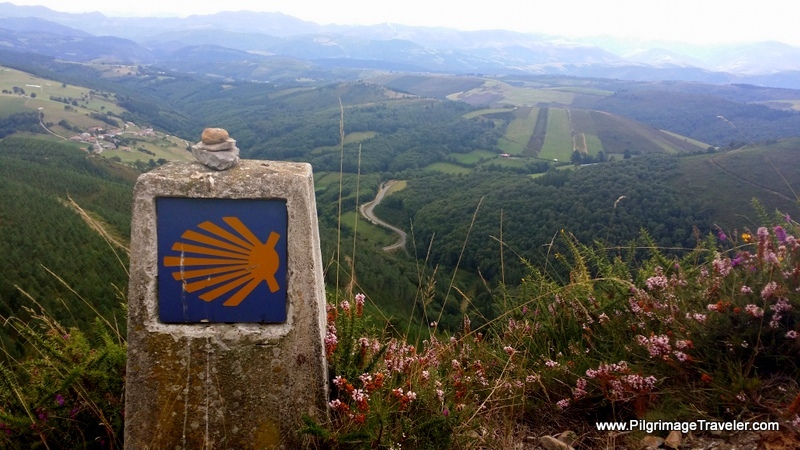 There are now a total of four albergues in Berducedo, all essentially right along the Camino. 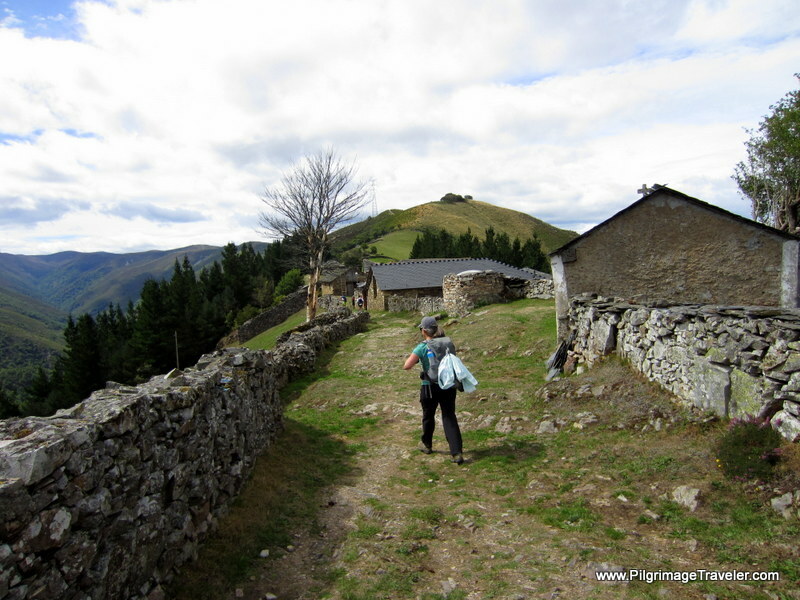 The remaining two are the Albergue Camino Primitivo and the Albergue Rural Camín Antiguo. Check our map above for their location. 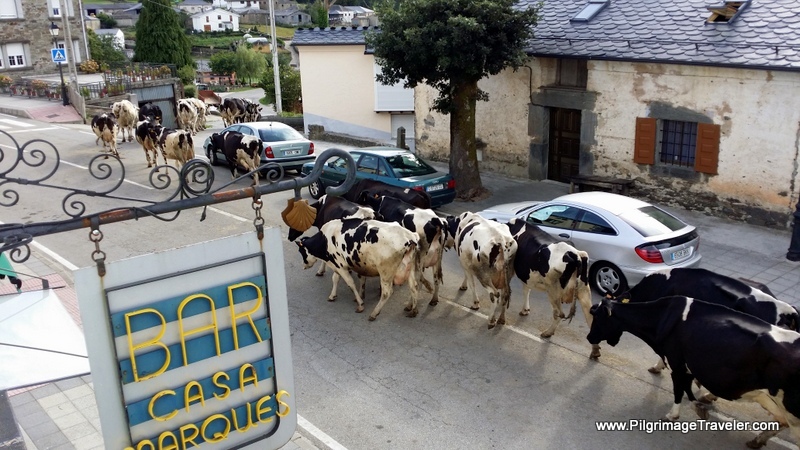 While cleaning up in the hotel, I heard cow bells ringing. I went to the window to have a look, and as I suspected, a farmer was driving his cows home, through town. 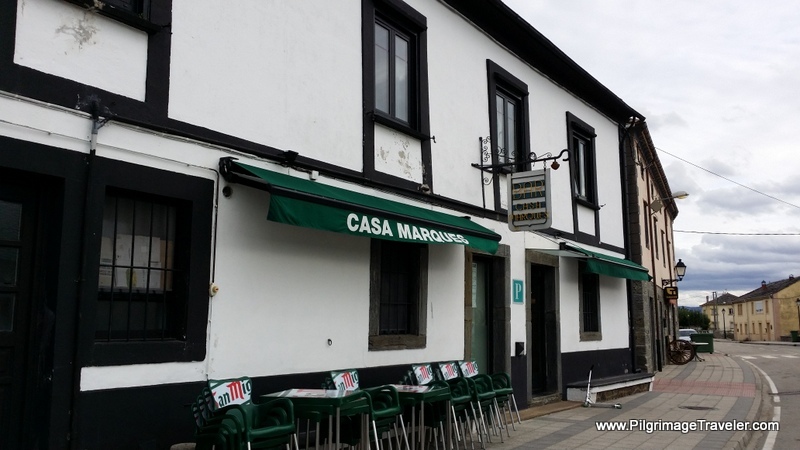 The family gathered around a large table in the Bar Casa Marques for dinner. I believe this was the only place in town, but it didn't matter. 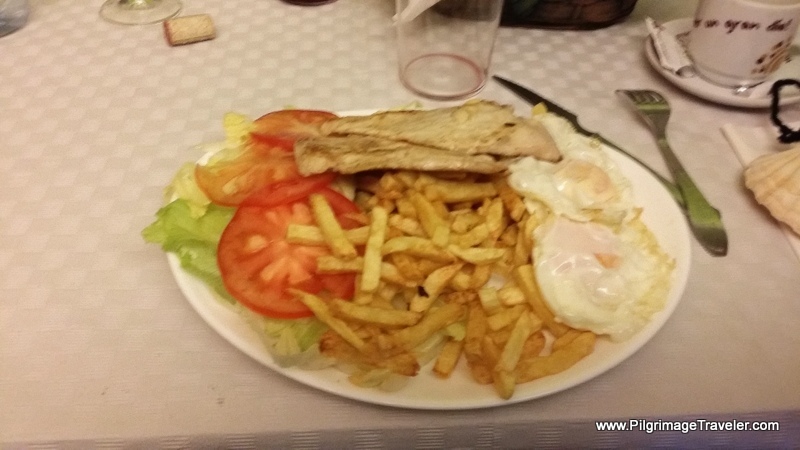 The pork chops, french fries and eggs were to die for! Most likely I could have eaten rubber and been happy that night. 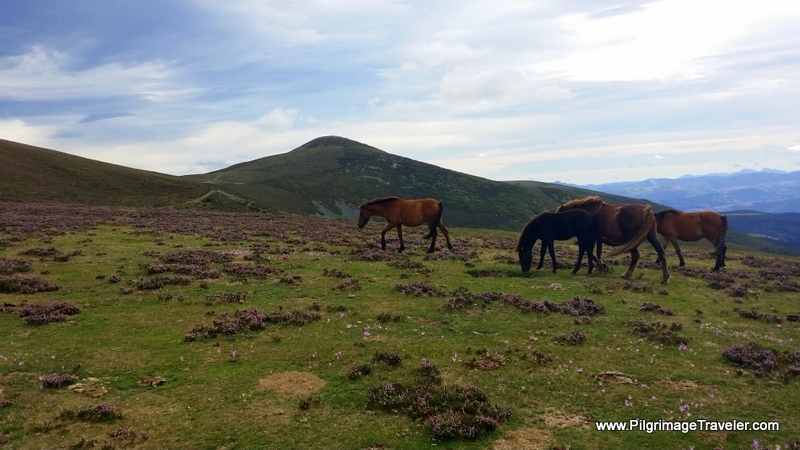 My day five on the Camino Primitivo would turn out to be the best day of my pilgrimage. I was overwhelmed with joy and energy for most of the day. I never ran out of stamina. 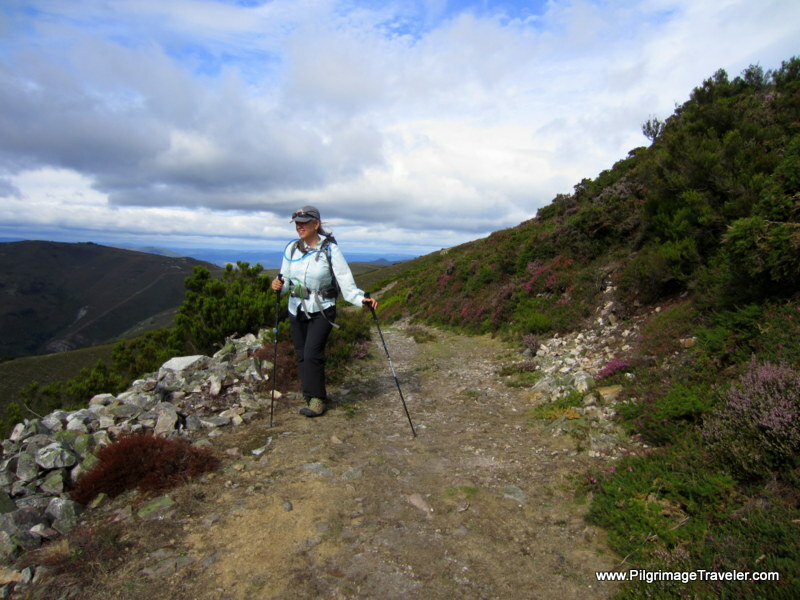 The walking was arduous, the wind ferocious for long, long stretches and it was a very lengthy day. 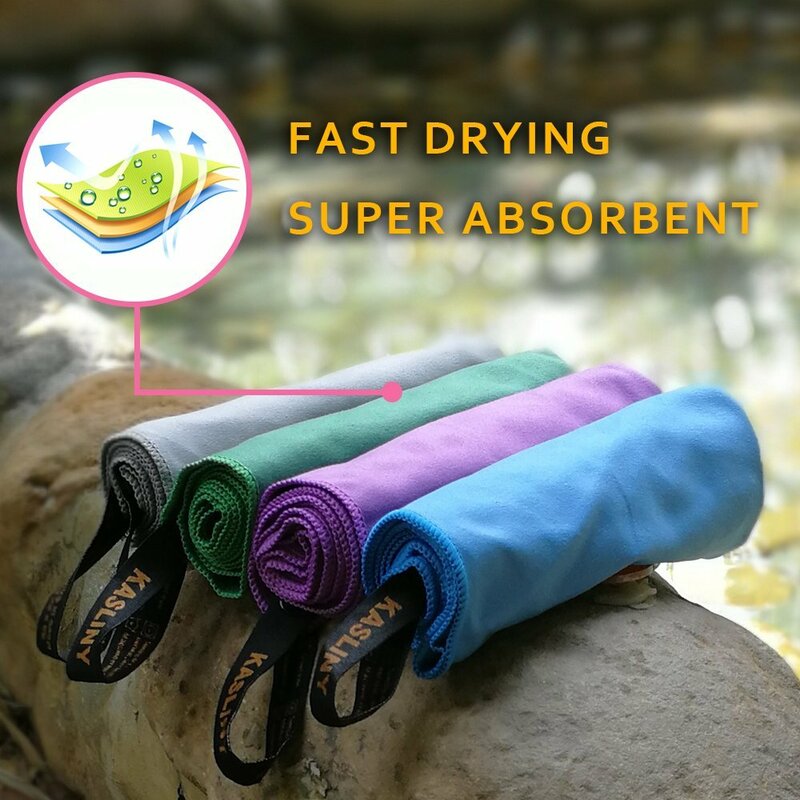 For all this effort, you will be rewarded by the scenery, awed by the intentions of pilgrims past, present and future, find emotional healing and have your own physical vitality super-charged. It is any wonder that I had an epiphany on this day? If my pilgrimage was to be a test of my faith in myself, and my soul, I realized that I could contemplate on this thought all that day ~ the entire pilgrimage ~ perhaps all my life. What does this look like for me? What does it mean for me, right now, in this moment? 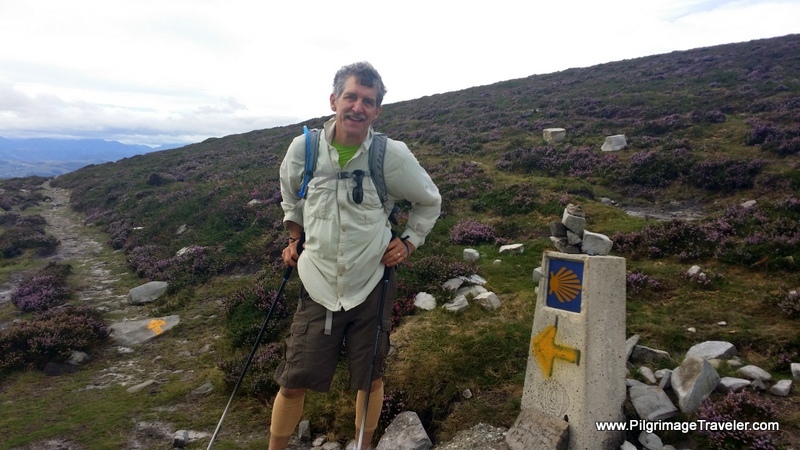 What day five of the Camino Primitivo did for me was to confirm that I was up for the task. I was ready. If I only knew what this would all mean. 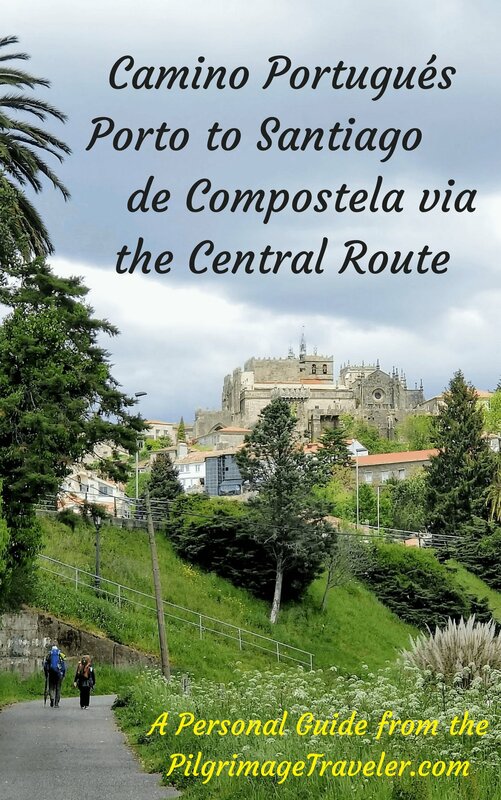 May your own pilgrimage travels be filled with personal insights as you enjoy your own day five on the Camino Primitivo, via the Hospitales Route! May you be graced with sunny and calm weather. May you also be filled with physical energy and unbounded joy! May you be infused with the power of the history that is before you! It is all there for you if you are willing to receive! Buen Camino!